Uneasy Empires: Time for Oracle to buy HP? Time for Oracle to buy HP? 2) Oracle CEO Larry Ellison takes a pot shot at HP's management/board/strategy/choice of pet dog. 3) Rumours swirl around Oracle acquiring HP. Except in the last week parts 2) and 3) have been noticeably absent. It may be that Larry and Oracle President Mark Hurd are still too busy chortling into their cornflakes to get on the line to their investment bankers. It may be that HP has finally demonstrated that its such a lemon that even Larry's magic touch can't turn it around. However now that the dust has (slightly settled) its probably worth thinking the unthinkable (again). Is it time for Oracle to put HP out of its misery? Click to see higher res image. Blue indicates a company offers products in this area. Dark blue are places where I think their offering is particularly strong. Any egregious errors/omissions are my own. First why would this deal make sense? If you want to understand it then look at the chart above. 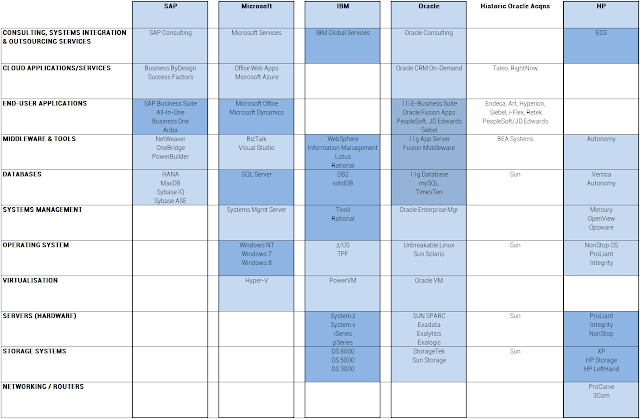 It shows how, over the past ten years, the enterprise IT has consolidated (largely via aggressive M&A) into vast end-to-end stacks owed by Oracle, IBM, and to a lesser extent Microsoft and SAP. As the market evolved these IT giants generated so much cash (remember tech is a low capital intensity/highly cash generative industry) that they could buy out smaller competitors on a whim. This led to an epic consolidation as a plethora of horizontal specialists (e.g. Sun for servers, Siebel for CRM, PeopleSoft for ERP apps) were consolidated into these giant single-owner tech stacks. Oracle has been particularly aggressive in pursing this strategy. Since the historic hostile bid for PeopleSoft in 2003, there has been an unending stream of multi-billion dollar acquisitions. First Ellison cleaned up the detritus of the software industry, including blockbuster deals for PeopleSoft, Siebel, BEA, Hyperion. Then in 2010 he turned on the hardware market with the acquisition of Sun, at the time a declining stalwart enterprise servers. The move into hardware heralded an important competitive shift. Historically SAP has been Oracle's biggest bete noire, but the shift into hardware meants its focus increasingly turned to taking on IBM. Indeed if you listen to their quarterly results calls (worth it, if only to be entertained by Ellison's hyperactive rants) its clear they they are talking about SAP less and less and IBM more and more. This is where HP comes in. Look back at the stack chart above - Oracle are very strong in databases and apps but for all their hot air about Exadata/-lytics/-logic IBM still spanks them in the grimy world of big iron server hardware. Acquiring HP would be a crucial boost in Oracle's push to take IBM on in hardware servers. Sun got them a toe in the water but was always a laggard in this market. In contrast IBM and HP and #1 and #2. The chart below shows HP's revenues and profits by division. Servers & storage are in purple. Actually its only HP's fourth-biggest profit driver. But this is the asset which Oracle prizes above all. If Oracle really wants to make in in hardware, it needs HP. Given the slow-moving nature of enterprise hardware (hands up any corporates who still have a Fortran box running their basement...), this isn't a market where Oracle can grind its way into the top two by organically taking share. HP is the only game-changer still out there. Services too (the old EDS business) is an area where Oracle lags behind the mighty IBM Global Services. This is probably less of a priority for Oracle - historically they have gotten shops like Accenture to do their dirty work. One area it could be useful is if the move towards cloud computing demands more experience running hosted services - EDS's experience in managed services could be helpful. 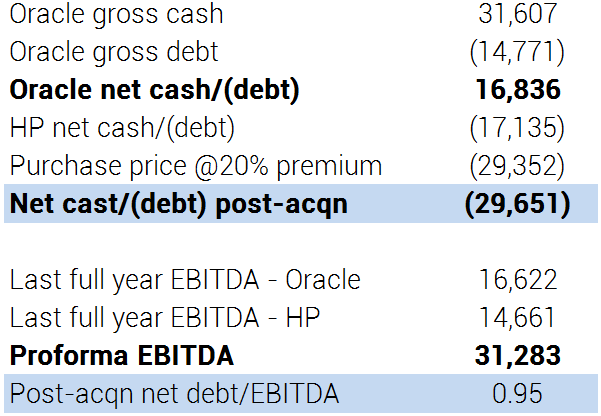 There are also some nice assets on the software side - again not game-changers given the relative size of Oracle's business, but assets with a degree of scarcity value. Ironically Autonomy is the most prominent here. Under the hood they have good technology and their expertise in unstructured data complements Oracle's strengths in relational databases. Vertica also has expertise in columnar databases which fits with Oracle's strength in row-based databases. This is particularly useful as in-memory/columnar structures are flavour of the month at the moment. Having this would strengthen their case against SAP's HANA offering. Finally Mercury is a market leader in software testing tools; a neat little play to capture developer hearts and minds. Its unlikely Oracle will have any interest in PCs and Printers (50% of revenues and 41% of profits). These would clearly be earmarked for disposal. This should be easy to achieve for the Printing business - historically the jewel in the crown for HP. In addition to being nicely profitable, the recurring stream of consumables revenues should be attractive to a financial buyer. PC's will be more tricky - but in a cutthroat business where scale matters an existing competitors like Lenovo might be interested in using it to bulk up its market share. To sum up: On paper, HP undoubtedly puts Oracle into a much stronger position versus IBM. Of course on paper Sony's strategy to combine film studios, gaming consoles, laptops and mobile phones was a great strategy. And look where it got them. The most important question isn't "does this make sense", it's "can Oracle make it work". It's difficult to argue that HP's execution in recent years has been anything other than worst-in-class - something reflected in its lowly stock market valuation. Simply removing this Lemons-in-the-C-Suite-Discount (like a Conglomerate Discount, but juicier...) should be worth a good 20% on the shares. More seriously though, when I analyse a "turnaround story" at a distressed company there are two things that can be wrong - either the portfolio of assets can be wrong or the execution can be wrong. I would much rather take bad execution over a bad portfolio any day. Improving a company's portfolio involves switching in and out of assets which takes a long time and gives plenty of scope to blow-up in the meantime. Improving execution involves switching personnel which can be done much more quickly. As I said earlier, aside from the hard-to-sell PC business I think the portfolio of assets at HP is right (or at least right for Oracle). It's the execution that's the problem. That, to me, is an encouraging sign (sic). If there's anyone who knows about how to gut and fillet and acquired business its Oracle. Starting with PeopleSoft in 2005 they have unmatched institutional experience in how to integrate and turn around acquired assets. Their most spectacular success was Sun where they completely turned around the margins in the hardware business and made an acquisition no-one thought likely a smash hit. They will be hoping they can do the same thing at HP. Of course Oracle's secret weapon is Mark Hurd, Oracle's Co-President and HP's former CEO. Given his five-year stint he will know where all the skeletons are buried, and undoubtedly have a big say in whether to do the deal. And if the deal goes through he's the right man to make it work. At HP he was known as a brilliant executor, although lacking in vision (arguably many of HP's problems lie in the fact that he failed to move the portfolio on from legacy hardware when he was in charge). 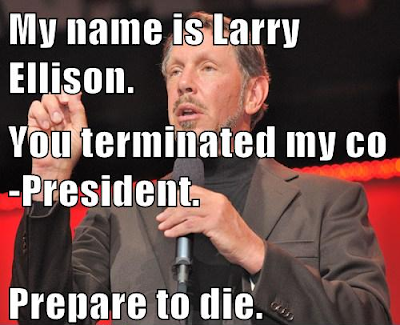 But at Oracle Larry Ellison takes case of the vision thing (and then some). Hurd's inside knowledge at HP and operational chops can be deployed where they matters most - integrating the merger. At its current lowly valuation (0.4x EV/Sales, 3.5x forward earnings) I don't think anyone will argue this will - on the face of it - be an expensive deal in valuation terms (we can get into whether those forward estimates are correct another time!). But can Oracle finance a bid. The other thing to mention, of course, is that for Oracle's controversial CEO, business is always personal. Larry Ellison's career is littered by endless feuds: With Tom Siebel, his former star salesman who upped sticks to found Siebel Systems. With Craig Conway, the PeopleSoft founder who labelled Ellison's hostile bid "atrociously bad behaviour from a company with a history of atrociously bad behaviour". But most of all with HP. When HP fired Mark Hurd, Ellison labelled it "the worst personnel decision since the idiots on the Apple board fired Steve Jobs many years ago". When HP bought Autonomy, Oracle said Mike Lynch "has a very poor memory or he’s lying" about an earlier attempt to shop it to Oracle. And don't forget that the current HP Chairman is ex-Oracle President Ray Lane, who Ellison fired in 2000. And of course as soon as Mark Hurd was a free agent, Ellison signed him up and made him co-President. If there's one think Ellison (and Hurd) would love, it would be to buy HP, fire the board, and make the business work. He'd love it if he beat them, love it! Why wouldn't Oracle do the deal? Of course M&A speculation is cheap. It's easy to talk about big deals, hard to do them (come on Apple, why haven't you bought TomTom yet?? :-p ). Putting the other hat on, why shouldn't Oracle do this deal? Will regulators shut down the deal? One big stumbling block would be if the deal can pass the regulators on both sides of the Atlantic. A PC / Printer spin-off would be a convenient smokescreen, but IBM would undoubtedly be screaming (big) blue murder at the prospect of Oracle and HP's server businesses ganging up. I think Oracle's strategy here will be to try to redefine the market. This is a neat trick they did when acquiring PeopleSoft/JD Edwards. At first sight it was clearly an anti-competitive move as it would reduce the market for large-enterprise ERP software to a SAP-Oracle duopoly. What Oracle argued though was the market was much broader than that and vendors such as Microsoft (actually an also-ran in ERP) should be considered. I suspect they could pull something similar here. IBM / HP is a small market but if you consider all the cloud vendors offering search/storage options (e.g. Google, which builds its own servers, or Amazon EC2) then the market suddenly gets a lot bigger (and muddier). Is the merger integration task too big? Larry Ellison has never had an issue with lack of ambition, but HP is an order of magnitude bigger than previous deals. There is clearly massive execution risk around HP's business. Whether this is too much for Oracle to chew is the big uncertainty. Arguably you could have had the same about previous blockbuster deals like PeopleSoft, but Oracle made them work. I think one point in Oracle's favour is that its main profit driver - maintenance revenues from databases - is very separate from the HP businesses. This means that even if HP blows up in their faces, cashflows from the database business will pour in regardless. This means that despite the size, this is not a bet-the-farm deal. Its worth putting the size of the potential transaction into context. this table shows Oracle's $1bn+ acquisitions ranked by size. HP would be three times the size of Oracle's biggest previous deal, PeopleSoft. But also look at the size of the deals relative to Oracle's market cap. HP is three times bigger, but so is Oracle's market cap. In terms of relative size its in the same ballpark (probably smaller once you strip out the PC and Printing businesses). So HP is big, but not as big as you think. Will the merger dilute Oracle's operating margins? Oracle is proud of its 40%+ margins, and rightly so. However naysayers point out that HP's single-digit operating margins will dilute Oracle's profitability. With Sun Oracle answered its critics by aggressively cutting costs and driving margins up; while they may hope that they can do a similar job here, HP is a lot bigger (and a WHOLE lot messier). I actually think this criticism is back-to-front. The important thing to realise is that high margins are not a good thing in-and-of-themselves. You can have high margins because you are cutting back on future investment and cash-cowing your business; you can have low margins (e.g. Salesforce.com) because you are investing like buggery to exploit a growth market. Rather high margins are good because they general correlate with a company's competitive position. A company with deep competitive moats and the ability to price its products at a premium generally earns high margins. A company in a commodity business generally has low or no margins. In short, a company has high margins because it is in a good competitive position. It is not in a good competitive position because it has high margins (NB also the same logic applies to Michelin Stars and restaurants, IMHO). As I said at the start, I think owning HP's assets makes Oracle's competitive position stronger rather than weaker. I suspect Ellison will be thinking along similar lines. Does Oracle want to be in hardware? To me the most serious objection to the merger is this: Does Oracle actually want to be in the hardware business? Given that hardware is pretty much at the bottom of the tech stack, then that's bad news for anyone in the Server business. At best you only have one or two customers for your servers (the big cloud companies) rather than thousands of brainless corporates. At worst the big cloud companies start to build their own servers. So to me the biggest question is this - does Oracle believe the world is moving towards cloud computing and if so would they rather sit back and let Amazon and Google kill IBM's server business rather than having to do it themselves? If the answer is to this question is "yes", then Oracle will not buy HP. However here's another perspective: This cloud driven disintermediation doesn't only kill HP's server business. It also hurts Oracle's database business. Same logic applies - it you move towards a Platform-as-a-Service or Software-as-a-Service model then the cloud vendor runs the data management part. So no more need to buy an (expensive) Oracle database. So its Innovator's Dilemma 101. Oracle have a vested interested in keeping customers off the cloud, or at worst pushing them towards a basic Infrastructure-as-a-Service model where they still need to buy an Oracle database. It's interesting to note some of their offerings such as the Exalogic "Cloud in a Box" (a contradiction in terms if there ever was one!). This seems to be pushing customers towards buying an integrated on-premise hardware appliance rather than entrusting their data an external cloud vendor. If that's Oracle's strategy then HP fit's right in. IBM could buy HP and absolutely own consulting, servers and storage. Great post. 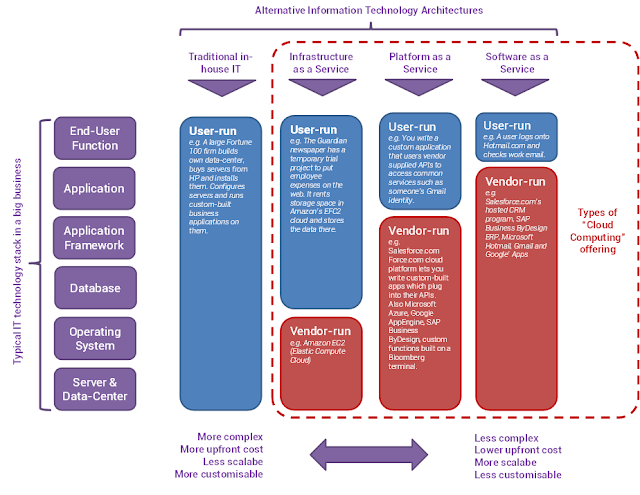 That lead-in to the first graphic, "The most important diagram in enterprise IT" hits the nail on the head. Yes its a chart I've had in my back pocket for years. It;s also provided a good field guide as to who gets bought out - very useful in that respect (e.g. when the big three BI guys Cognos, Hyperion, BOBJ, went to the big three stack players in a year or so). IBM / HP would give them a lock on that market yes, although I wonder if the competition/regulatory issues would be too great for them to overcome. Great post - as you say the risk for Oracle is that clients find a way to do their own ERP via the cloud and bring it all inhouse via a commodity database that they design themselves, and outsource the programming and maintenance to an offshore programming house. I greatly enjoy both your blogs, keep it up! I agree with much of what you say. Oracle have a vested interested in people keeping the current (parts of the current) tech stack in place (note how if they want the cloud they make loving eyes at EC2 as it still means you need an ORCL licence). And the good thing for them is enterprise IT is so slow-moving this will persist for a long time. No matter what the attractions of a funky cloud architecture are very few big corporates have the DNA to make that jump. What's most interesting in this respect is SAP's strategy of using HANA as a "trojan horse" first to move the analytics onto it as a mirrored version of the DB and then cut across to it for the full transactional ERP data (at which point ORCL gets booted out) - Hasso Plattner always bangs on about this in his SAPPHIRE keynotes. If (and its a big if) they can get this to work it is a significant threat to ORCL. Oracle have two weaknesses here. 1) they are not integrating their data mgmt platform and their apps because they are help back by the tech spaghetti of multiple acquired platforms - PSFT, JDEC, SEBL, plus E-Business Suite and now Fusion. 2) If SAP are bold enough they have the capacity to really undercut ORCL on pricing - after all they make zero on the database at the moment so even if they charged 50% of what ORCL charge its all new money for them. Why not Microsoft? To me that seems like a better fit. Not only are there less overlaps, it would give Microsoft businesses that would enable it to better compete not only with Oracle but IBM too. It's possible but I see two main objections. 1) Conflict with existing partners: Microsoft's operating systems run not only on HP's servers, but servers from HP's competitors like Dell. They will not be happy about a key supplier moving into competition with them. The same logic is true on the PC side of the business (similar to Google taking over Motorola); guys like Acer are already unhappy about Surface competing against them. MSFT taking on HP's PC business would take it to another level. Of course it is possible that they divest the PC business. Or even that they want to go all-in as Apple has done and do end-to-end integrated products. But if they do so Dell, Acer et al will start looking seriously at other options. 2) Doesn't add anything to HP's current position: MSFT has no presence in HP's three big product businesses - PC, Server and Printers. So that's good in that it means they are complementary. It's bad though in that MSFT will simply inherit all of HP's current market share issues. At least Oracle can claim adding Sun and bundling Oracle's software into an "Appliance" will bolster HP's position in the server market. MSFT has much less ammunition in their enterprise portfolio to do this with. While I can't argue the ego / irrational factors at play here, I'm not sure there is enough "stuff" in HP that can be packaged w/ or used as a solution / systems sale. Love the blog, do you plan anything on Workday and how it can grow into its valuation? Interesting she makes the point that PSFT/SEBL etc was about buying installed base. To a degree HP is the same rationale; consolidating the market between them and IBM - although admittedly it doesn't come with the chunky maintenance revenues the software businesses had. Obviously Workday may be the holdout. Haven't looked at it that closely but I saw Duffield was vocal in the press a few months ago about how much he really loves Larry Ellison (just joking!). I plan to write on Big Data next. After that maybe I'll have to time to do a survey of some of the smaller cloud vendors. My suspicion is that just like the best-of-breed ERP vendors before them they do end up getting consolidated by SAP, ORCL. The question is whether CRM crashes that party - I think Salesforce needs to expand the breadth of its product offering. Partnering with other guys on some kind of Force.com platform just doesn't seem to be making progress fast enough. Did you know you can create short urls with Shortest and earn money from every visit to your short links. Bluehost is one of the best website hosting company with plans for all of your hosting requirments. There are many software options for your company. I tried some of them and from all of them I prefer ERP by Microsoft Dynamics. Click here to visit their website and find out more about the system. Maybe it will help you too?